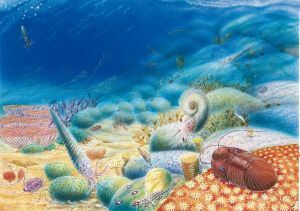 An interpretation of the Geopark's coral reef, based on fossil evidence, artwork by Brin Edwards. In the early 18th century when scientists were developing a system of naming the principal periods of geological time, heated debates and arguments occupied the members of the British "Geological Society," based in London. The mapping and interpretation of the geological strata of Devon was causing some consternation. The leading geologists of the day, Roderick Murchison and Adam Sedgwick had mapped the strata in Wales and established the classic Silurian and Cambrian systems, and did not believe the results of mapping undertaken of what were considered similar rocks by their colleague Henry Thomas De la Beche in Devon. 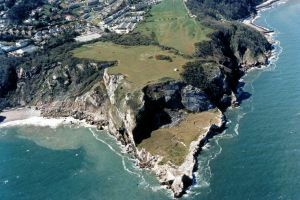 In 1839, Murchison was forced to give up his original ideas, when fossils found in the limestones at sites in Torbay, such as Lummaton Quarry, made an important contribution to understanding what was happening on Earth from around 409-363 million years ago. Largely through his own scientific re-interpretation, the period of geological time named the Devonian was proposed and was soon used globally to identify rocks and fossils with a similar age.